ASHLEE OLIVIA JONES has mastered an astonishingly accurate impersonation of this utterly unique 1950s star. It was a treat to see her superb performance! Needs Professional Polish in bridging the stage waits for costume changes (and maybe a backstage dresser too), an ending that pulls the story together, and (at least) a medley of the 1950s songs that made Ms Kitt famous, so that today’s audience, a half-century later, and more, can be captured by her magic too! 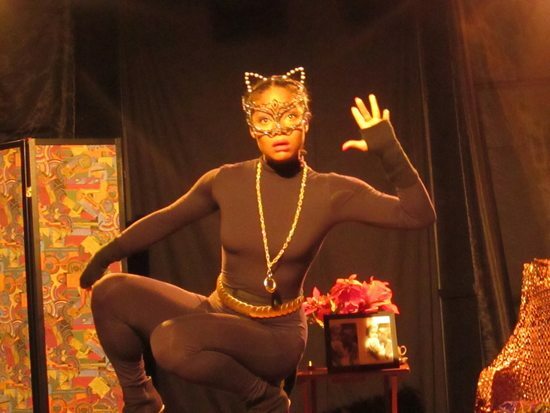 ASHELEE OLIVIA JONES has mastered the unique style of EARTHA KITT to an astonishing degree, which made her solo show a must-see for me. What she needs now is a script that ties it together more professionally. In 40 minutes she hits the tough points in Eartha’s life—-her ragged childhood, her huge but healthy ego and the Truth-to-Power confrontation with Mrs LBJ that derailed her career temporarily. What’s missing is an ending (Still to Come), something to cover her four lengthy costume changes (Stills Still to Come) and more musical punctuation than we now see. ASHLEE is SO Eartha that she can easily give her audience a medley (at least) of the 1950s tunes that made Ms Kitt a star—-and she should!